This is an awesome pattern! I have wanted to make one for years. But the patterns were always too difficult, even for me and I have been sewing for about 50 years. My granddaughters will love it! They like matching with their dolls, so they will want one for themselves. I think I can figure out how to make a larger one after making this one. I can’t wait to do another one. The hard part for me is picking out fabric. I have a room full and can’t decide. haha. Thank you for this pattern! Whohoo!! I’m so glad you like the pattern and found it “do-able”! I totally agree about picking fabrics and stash overload. 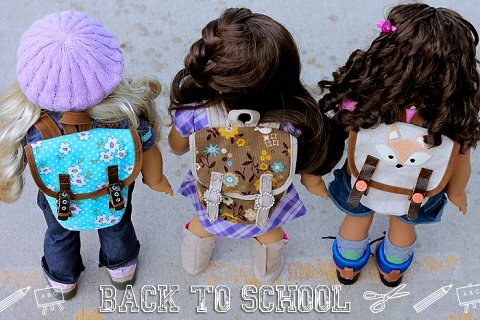 I have enough stuff in my sewing closet to make about.. hmm… 5000 dolly backpacks? 😀 Thank you so much for taking the time to try the pattern and commenting! Hi! I don’t know where to get the closure straps? Any ideas? I live near a Walmart, Joanns’ and michaels! Hi Steph, your website is wonderful! Love your patterns. I signed up but don’t see a link to the fox applique, can you tell me where to find it?